Cast: Julia Montgomery, James Carroll, Suzanne Barnes, Al McGuire, Lauren-Marie Taylor, Rutanya Alda, Hal Holbrook, David Holbrook, Laura Summer, Mart McChesney, Carrick Glenn, John Didrichsen, Lois Robbins, Mathew Dunn. Rated: (for violence/gore, drug content and language). Reviewed by Dustin Putman, October 2008. My daughter was about your age, then she met a guy like you. Now she's dead. The night after Ohio's DeWitt University wins the big homecoming basketball game, the team's mascot is slaughtered and his furry bear costume stolen. As the students participate in a radio-sponsored scavenger hunt on the campus, the killer sets out to paint the co-ed population red, courtesy of the sharp knives he/she has implanted in the suit's paws. A little-known 1980s slasher installment, "Girls Nite Out" bucks the trend by evading many of the genre's rules. There is no final heroine, for oneJulia Montgomery (1984's "Revenge of the Nerds") comes closest as the sunshiny Lynn Connors, but doesn't have a climactic chase with the villainand the soundtrack is filled wall-to-wall with classic pop hits of the '50s and '60s (i.e. The Lovin' Spoonful's "Do You Believe in Magic" and "Summer in the City," Ohio Express' "Yummy Yummy Yummy"). The twist ending, meanwhile, is so twisted and freaky that it's a shame the characters have been so interchangeable and their onscreen shenanigans so forgettable up until then. 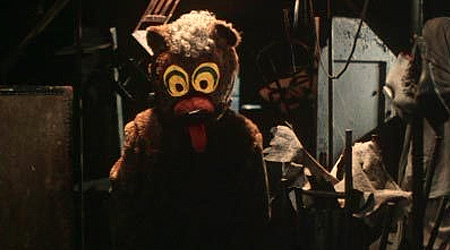 Still, when the bear-costumed killer attacks, an everlasting innocuous smile plastered across its face, director Robert Deubel knows a thing or two about creating suspense and using atmospheric shadowy lighting to its fullest. In a phoned-in role, Hal Holbrook (2007's "Into the Wild") looks as if he'd rather be golfing as a sheriff who smells a link between the current mayhem and his daughter's murder. For the devious bad guy's creative and unsettling garb alone, "Girls Nite Out" earns more points than it otherwise probably warrants.